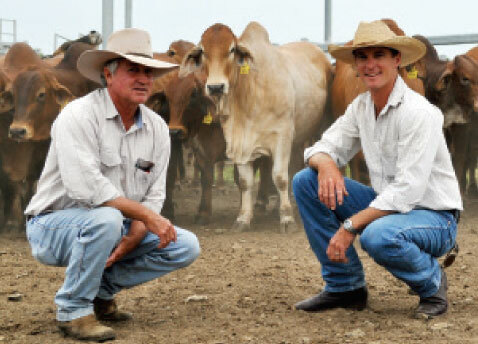 Lot feeding Brahmans has driven a profitable business shift for Central Queensland beef producers Peter and Ann Kirk and family. Their Petann Pastoral Company, based at Weir Park, Gogango, previously bought and fattened feeder steers, but large scale lot feeding over the past five years has freed up paddock space, enabling the enterprise to run 1750 high grade Brahman breeders. Kevin Geddes, who manages the lot feeding side of the business, said the Kirks lot fed 2000 to 3000 head a year including 700 home-bred steers. The cattle are fed for 100 days at Waterfall Feedlot near Goomeri, with the majority grading Jap ox at 22-23 months with either milk or two teeth. Depending on grain prices, they also lot feed 200-300 of their own heifers a year, most for 60-70 days to meet the trade market. Mr Geddes said lot feeding offered certainty of return and quicker turnover of stock. "It allows us to run more bullocks in the paddock and turnoff at a younger age. The feedlot is the best bullock paddock of the lot," Mr Geddes said. "We mostly contract them before they go on feed so we know what we're getting for them and know in advance what the feed costs will be because they are locked in three months in advance." A typical draft is weaned at 9-12 months and de-pastured on buffel grass on river country at Gogango before being trucked south for feeding. "We feed cattle that we buy in and we breed, and nothing is doing better than the Brahmans," Mr Geddes said. "Where a Euro-cross might be gaining 2.2 to 2.6kg a day, it's eating 16kg compared to the Brahman that's eating 13kg. The feed conversion is great and that means more profit." Waterfall Feedlot owner Robert Maudsley said the quality of Brahmans had improved steadily over the past decade and the breed's performance on grain was on par with other breeds. "Brahmans don't eat as much as other breeds but they do just as good as the other breeds in terms of weight gain," Mr Maudsley said. Typical weight gains for the Kirk's Brahmans are 2.7kg/day for steers and 2.3kg/day for heifers, across 100 days on grain. In May the Kirks killed a line of their No. 9 steers and the lead of their No.0 steers, with impressive results. The 154 steers averaged 598kg on the hoof, dressing out at 327kg or 54.9%. The tops of the line dressed out at 60.7%, with 86% having a dressing percentage above 53%. Mr Geddes said the line returned an average rate of 385c/kg with more than half of the draft achieving the top grid price of 390c/kg. Although profit margins fluctuate throughout the year due to input prices, Mr Geddes said the feed conversion efficiency of Brahmans helped keep profits in the black. "If you can get more than two kilos a day in weight gain you're keeping your nose in front," he said. "We're averaging 335 to 345 kilos dressed at two years of age and this gives us an average return of about 369 cents across the year. Most are milk or two tooths, generally with 13 to 15 mm of fat at the P8 site." On arriving at the feedlot the cattle are treated with growth promotant, drenched, dipped and tagged. "This costs about $13.60 a head but if you don't do it you have about a 25% loss in daily weight gain," Mr Geddes said. Selective breeding has also improved weight gains for the Kirk's cattle. Last year they purchased 15 bulls through Rockhampton Brahman Week Sale, paying $4850 average. They select herd bulls with good length and thickness and as well as eye appeal also take into consideration factors such as eye muscle scans and fat measurements. Mr Geddes said the best practices used at Waterfall Feedlot ensured cattle remained healthy and gained the optimum amount of weight while on feed. The feedlot feeds a silage-based ration three times and day and water is changed every two days. "We've never had a death and there's no hot feet," Mr Geddes said. The feedlot was also chosen for its proximity to southern Queensland meatworks, such as Kilcoy.